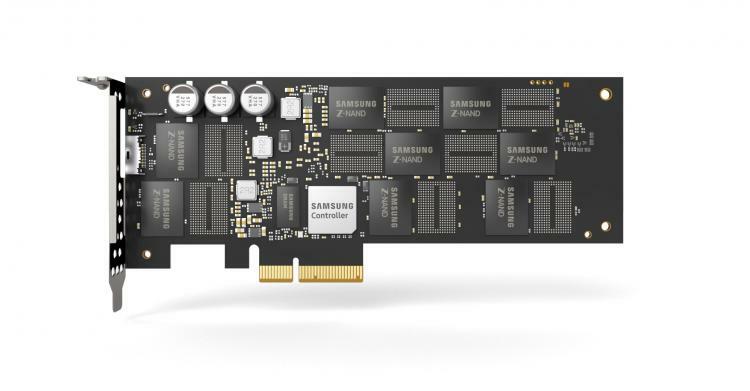 Samsung launches an 800GB-capacity of the new SZ985 Z-SSD for the most advanced enterprise applications such as AI Analysis and supercomputing. The Samsung Z-SSD line offers the most efficient data storage solution for high-speed cache data and processing log data. Samsung claims it will definitely address the increasing demands from the AI, large data, and IoT markets. The new single port, four-lane Z-SSD features Z-NAND chips that provide 10 times higher cell read performance than 3-bit V-NAND chips, along with 1.5GB LPDDR4 DRAM and a high-performance controller. Armed with some of the industry’s most advanced components, the 800GB Z-SSD features 1.7 times faster random read performance at 750K IOPS, and five times less write latency – at 16 microseconds, compared to an NVMe SSD PM963, which is based on 3-bit V-NAND chips. The Z-SSD also delivers a random write speed of up to 170K IOPS. Samsung will be introducing 240GB and 800GB versions of the SZ985 Z-NAND SSD and other technologies at the ISSCC 2018. Read Samsung’s Z-NAND Technology brief here.